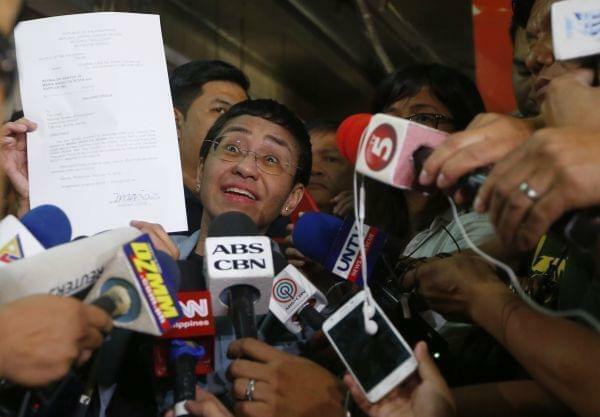 Maria Ressa, the award-winning head of a Philippine online news site Rappler that has aggressively covered President Rodrigo Duterte's policies, shows her release order after posting bail at a Regional Trial Court following an overnight arrest by National Bureau of Investigation agents on a libel case Thursday, Feb. 14, 2019 in Manila, Philippines. On The 21st: Last year, 54 journalists were killed while doing their job, and hundreds more are in jail. We'll speak with Joel Simon, the Executive Director of the Committee to Protect Journalists. Plus, Illinois Democrats have been passing a series of progressive bills in the last two months, thanks in part to their big election win last November. We'll get an update on how the legislative session is going. Every year, hundreds of journalists around the world are attacked, imprisoned, kidnapped or killed. If you even think back on the past year - many names come to mind: Jamal Khashoggi, who was murdered at the Saudi embassy in Turkey. The Capital Gazette in Maryland, where five employees were shot and killed last summer. And some recent cases, just in the past month. Like Maria Ressa, who was arrested in the Philippines - or The Sacramento Bee’s Dale Kasler, who was briefly detained by police a few weeks ago after covering a Stephon Clark protest. The Committee To Protect Journalists tracks all of these cases - and is an nonprofit dedicated to not just defending the work of journalists, but also press freedom all over the world. As the executive director of this organization, Joel Simon knows these stories well. He’s in the Midwest doing a visiting residency at Beloit College. This week, he’s helping the school cap off a year of programming on the Freedom of the Press. He joined us from the Wisconsin campus. "This is an issue filtered through a country's political culture." The US government doesn't negotiate with terrorists, but some countries do. It's been about two months since the Democrats took control of every statewide office, and enough seats in the legislature to have a supermajority. In practice, it’s meant that a lot of progressive bills have been signed into law pretty quickly. For example, a minimum wage increase to $15 an hour over the next six years passed both houses and was signed by the governor, all before his first budget address. There were a few more bills that hit the governor’s desk last week, and possibly more on the way soon. And for more on that we spoke with Mark Maxwell, capitol bureau chief for WCIA3, along with Doug Finke, statehouse reporter with the State-Journal Register.